Sweetened balsamic vinegar makes the berries sing! You can use regular sugar instead of superfine, and try substituting arugula for mint leaves. Put the strawberries in a glass bowl. Combine the balsamic vinegar, sugar and lemon juice in a small saucepan and stir over medium heat for 5 minutes or until the sugar dissolves. Remove from the heat and cool. 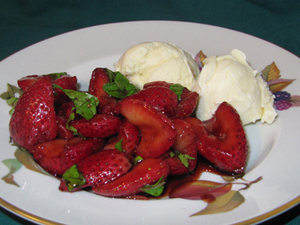 Pour the balsamic mixture over the strawberries, add the mint leaves and toss together. Cover and refrigerate for 1 hour to allow the flavors to develop. Serve with vanilla ice cream.